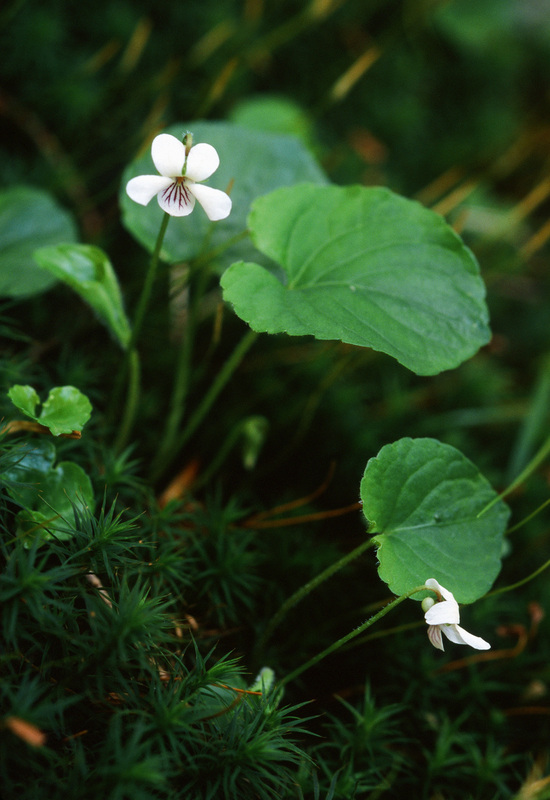 The most common white flowered stemless violet in eastern North America is Viola blanda. 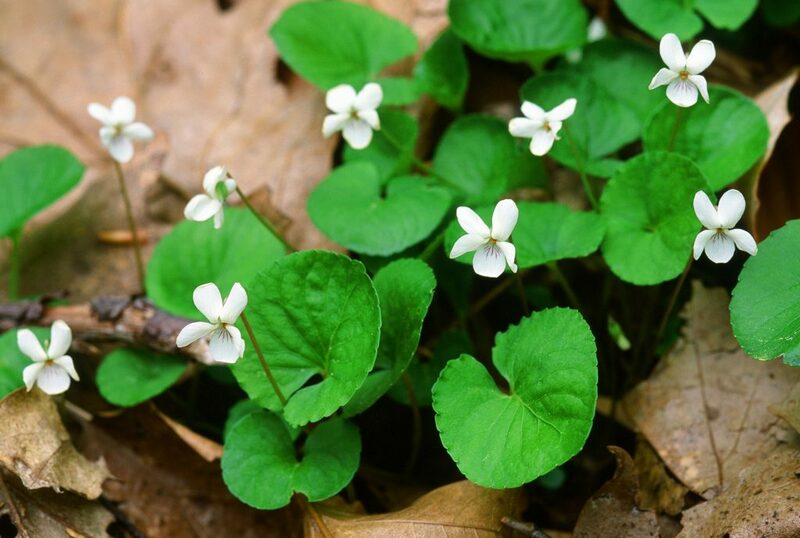 It grows in shaded damp deciduous woodlands at lower elevations, flowering at the time the deciduous trees are leafing out, or even later. Except for the upper leaf surface, the whole plant is usually glabrous. 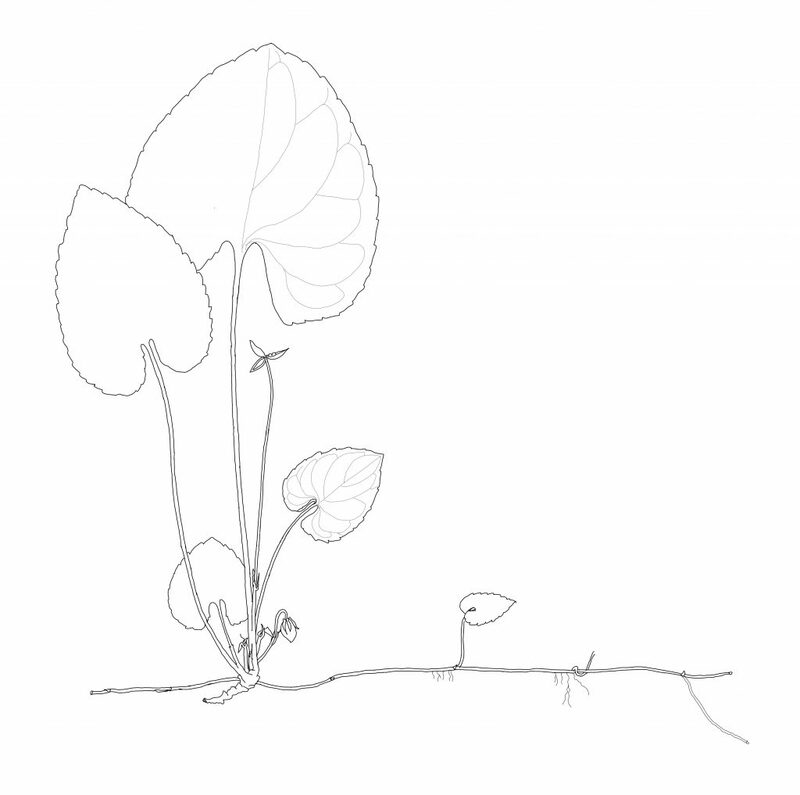 Its rhizomes are relatively long, white, sometimes branching and the old leaf bases are not concentrated on the rhizome. Its sweet scent is a misleading identifier as it is only obvious when the temperature is warm, presumably high enough for bees or other pollinating insects to be active. In summer leafy stolons spread out from the head of the rhizome to start new plants for the following season. Characteristically shaped mature leaves are oblong, gradually pointed at the tip and with very close or overlapping long leaf lobes, leaf blades 3–6 cm long flowering. Leaves can be variable in colour from bright lime-green to dark green; glabrous on the lower surface, and with short stiff hairs on the upper surface towards the margin and basal lobes. Its white flowers are larger than 1.0-1.5 cm, the two narrow upper petals reflexed especially as the flower ages, lateral petals are often twisted and usually beardless, the lowest petal wider but shorter than the other petals with purple guidelines; the brilliant green stigmatic head contrasts with the orange connectives on the stamens. The petal spur 1.5-2.0 mm, 1.5-2 x the sepal appendages. 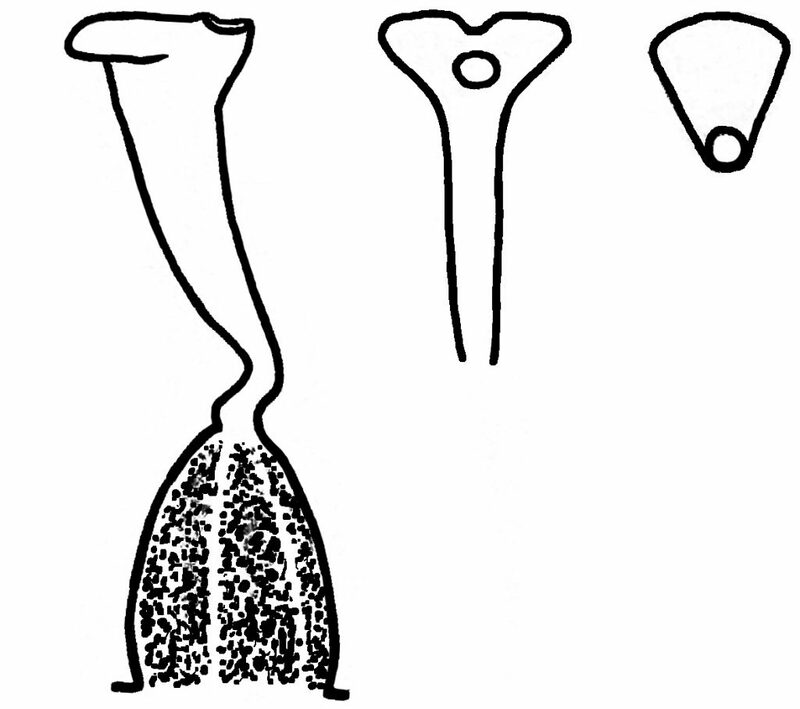 Cleistogamous (closed) pods are produced on stolons as well as from the head of the rhizome; pods ovoid, 4–6 mm long. Seeds are mid to dark brown, lightly mottled, 1.7-1.8 x 1.0-1.1 mm. 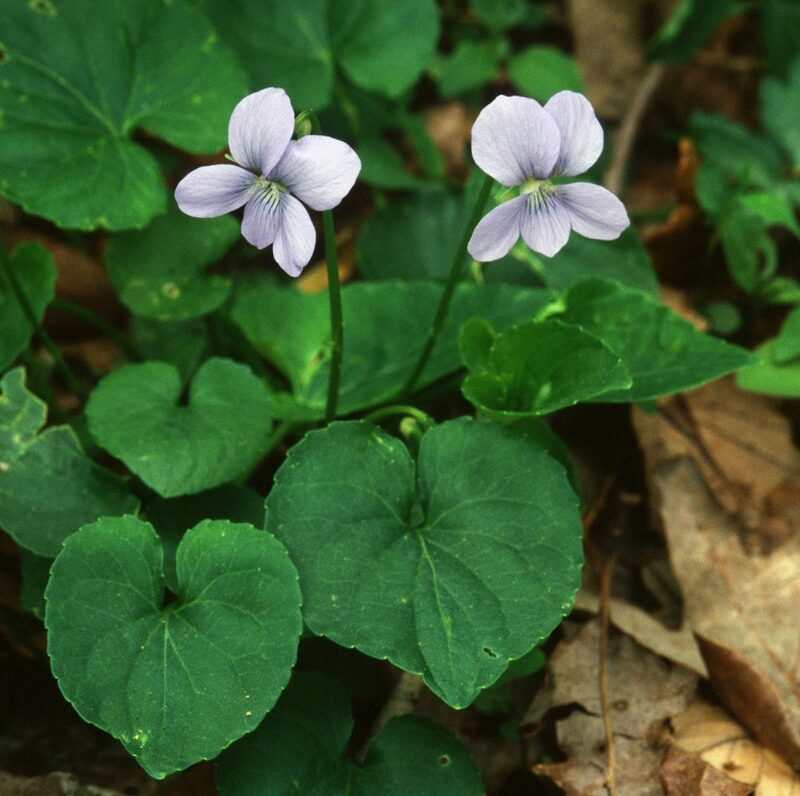 Viola blanda is primarily an Appalachian species, found westward as far as southern Indiana. It flowers several weeks later than V. pallens from late April to May (to June at higher or colder locations). 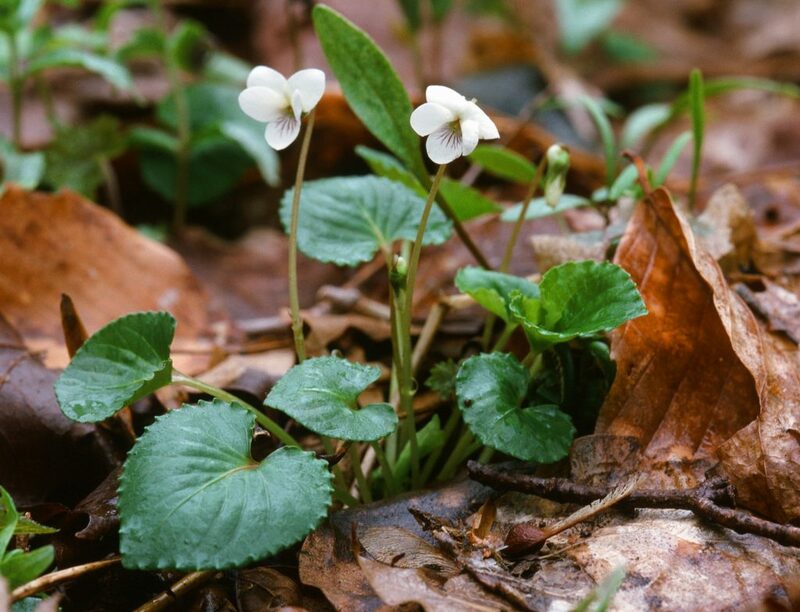 Usually it is in beech-maple or mixed deciduous forests or under hemlocks, especially in cool ravines or valley floors where acid soils from metamorphic sandstone are overlain by very moist, rich leaf litter. Summer leaves are larger, up to 8 cm long. Now included in synonymy under Viola blanda is V. incognita described by Brainerd in 1905(b). 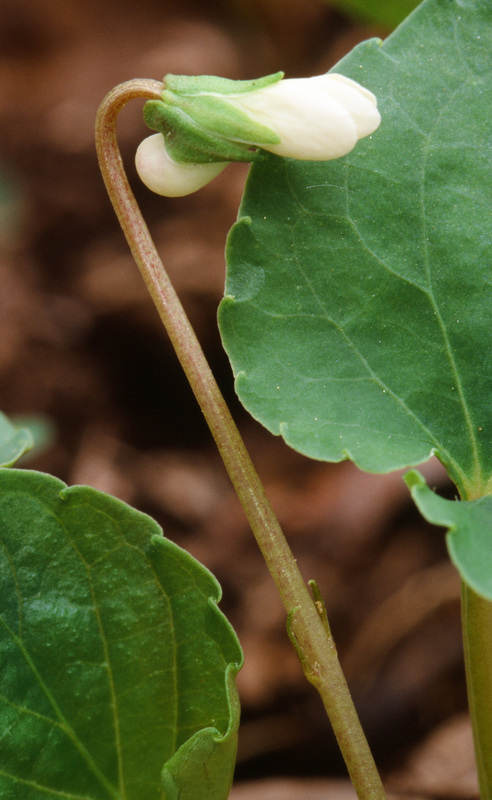 The latter was originally described as varying from Viola blanda in several characteristics: peduncles, petioles and laminas of leaves are pubescent with soft white hairs especially when young though the distribution of pubescence is very variable; summer leaves are large, rugose, broadly cordate-ovate with diverging lobes, tip acute; lateral petals bearded, upper pair obovate; summer stolons vigorous but less leafy. 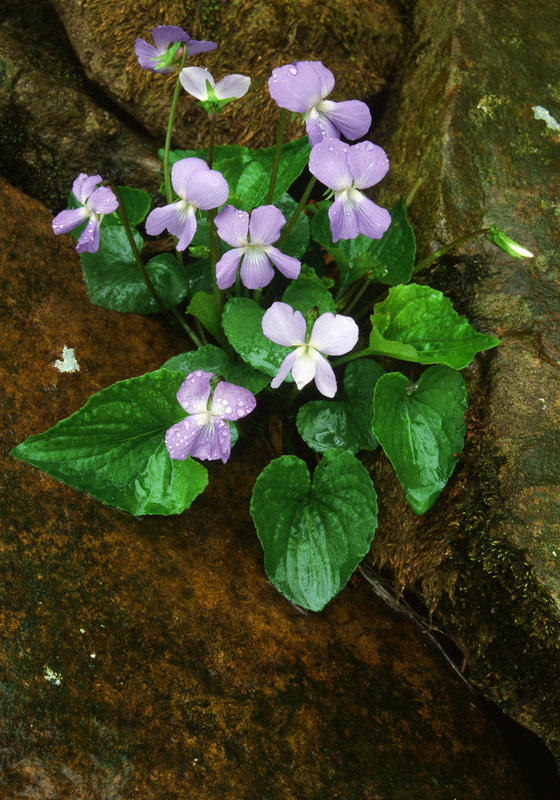 In 1965 Russell observed that Viola incognita is found usually in glaciated territory and Viola blanda in non-glaciated. Where Viola blanda and Viola incognita grow together, hybridization will occur. However, Ballard (1994) says that a greater amount of morhological variability has been found in specimens across the reported range and considerable overlap exists in all characters previously used to distinguish the two species. In the absence of compelling evidence for the recognition of two taxa, all populations are treated as a single polymorphic species. Common from Labrador, Newfoundland, Nova Scotia, Prince Edwards Island, eastern Ontario, south and westward through the mountains of northern and western New England, south to the southern Appalachians; AL, DE, GA, IL, IN, KY, MA, MD, ME, MI, MN, NC, ND, NH, NJ, NY, OH, PA, RI, SC, TN, VA, VA, WI, WV. The Michigan plants are of the V. incognita pubescent type. 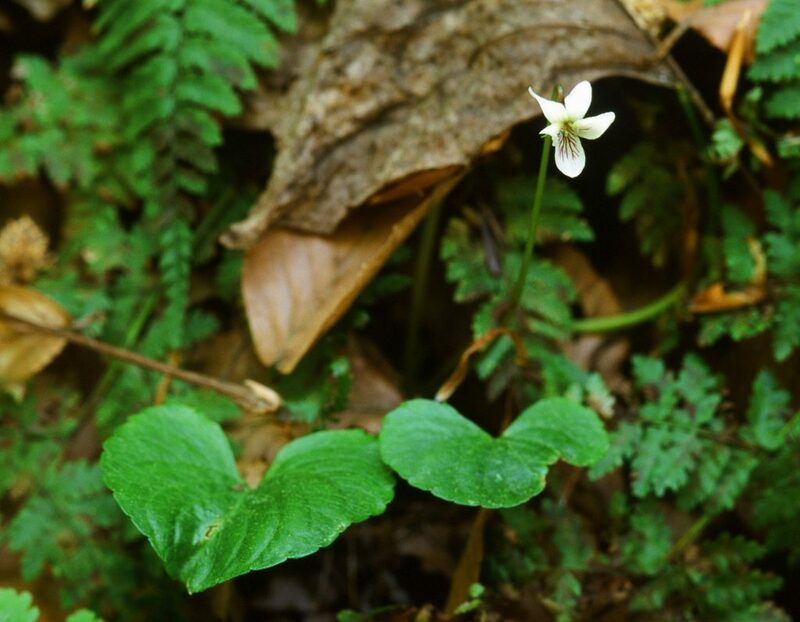 In most locations where V. blanda and V. cucullata grow in the same area, hybrids between the two can be seen. Plants photographed near Shartesville, PA clearly show characteristic V. blanda shaped leaves, quite different from typical V. cucullata. 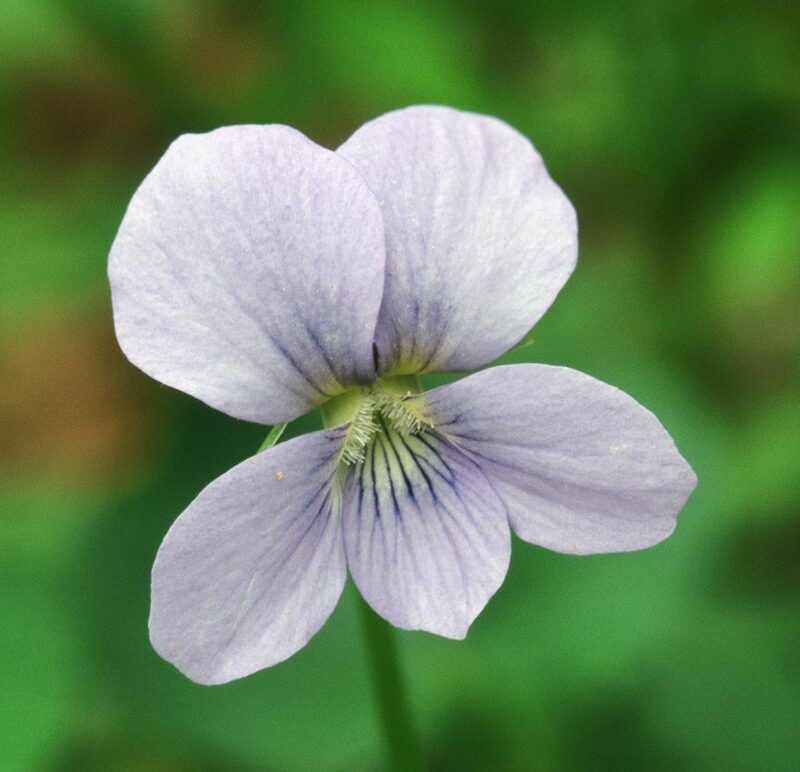 The pale blue flowers show light cucullata markings on the top four petals. 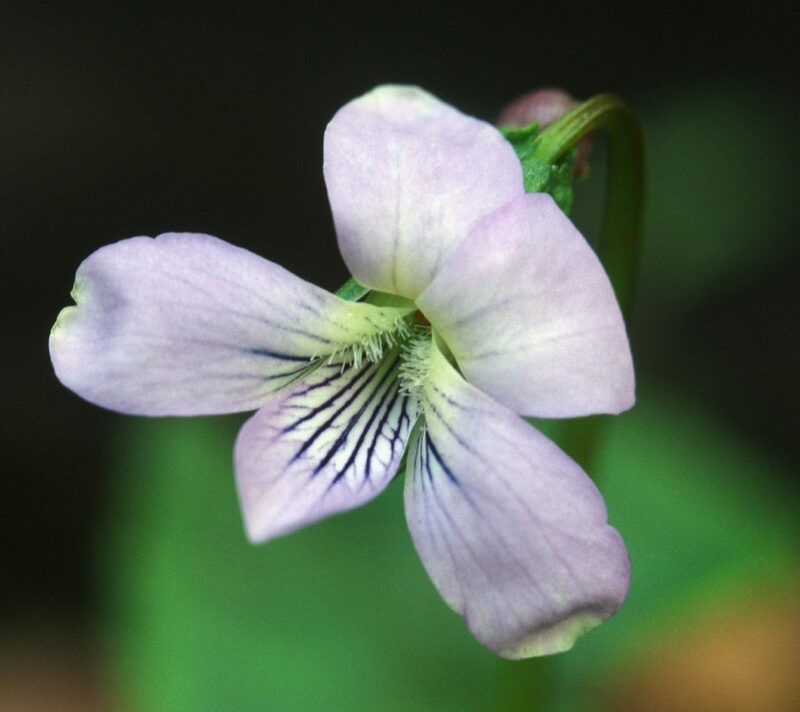 At Dolly Sods, West Virginia, hybrid flowers were either white or blue, but had Viola blanda type purple spotted pods. Section Plagiostigma Gershoy, subsection Stolonosae Clausen. Viola blanda Willd. Hort. Berol. t. 24. 1816, describing plants collected in Philadelphia, Pennsylvania. 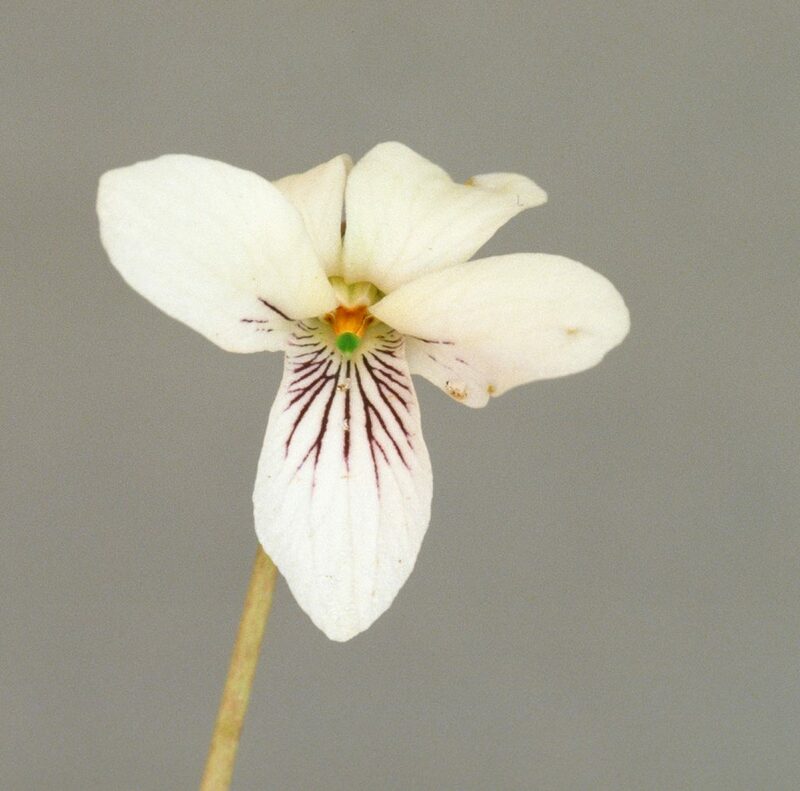 Early confusion between this species and Viola pallens is discussed under the latter species. 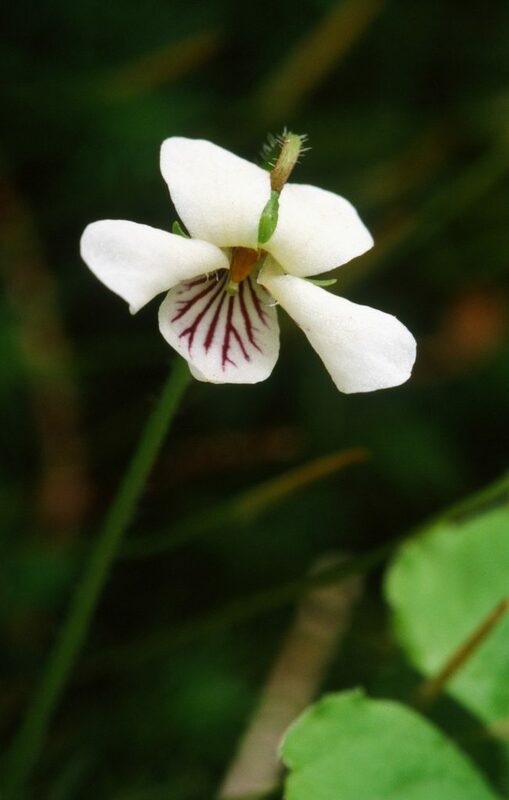 The common name ‘Sweet White violet’ is misleading as its perfume is not as strong as that of Viola pallens. 2n=8x=44 (octoploid). Gershoy’s early chromosme counts of 2n=48 for V. blanda and 2n=42 for V. incognita were apparent errors; 2n=44 was later reported by Gershoy himself (1934) and subsequent authors. Chromosome analysis (Marcussen et al. 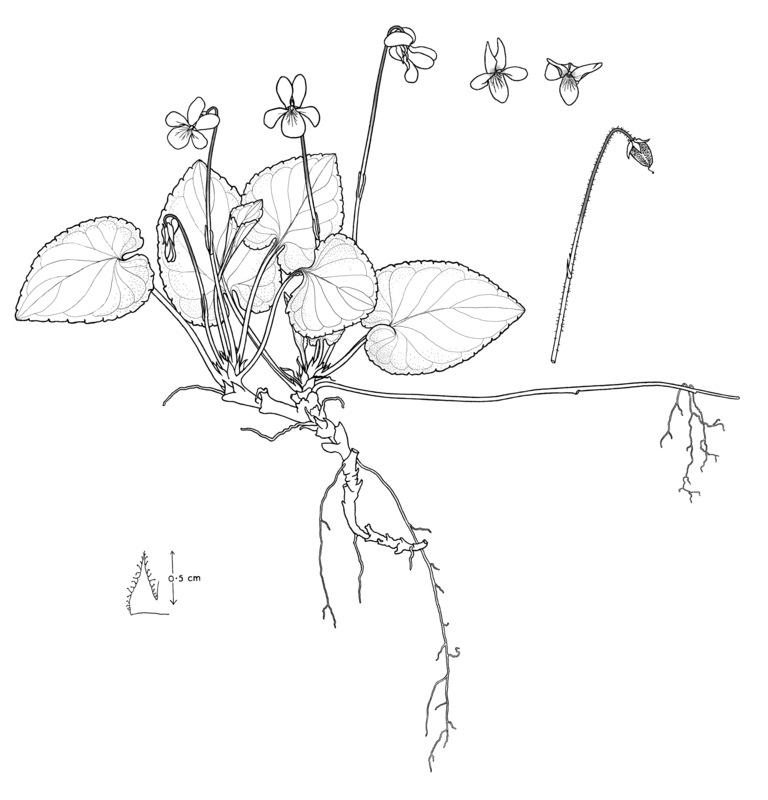 2011) indicated that Viola blanda is the allopolyploid of V. renifolia and an unidentified Primulifoliae species. Aneuploid drop from 2n=48 to 2n=44 is common in polyploids.